A colleague at work recently told me that I should check out PlantUML. His advice is usually good, and this is no exception. 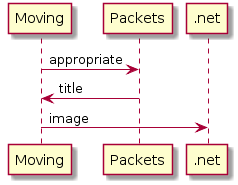 PlantUML uses a relatively simple text language to describe the desired diagram, then makes generation of the image as simple as processing the UML file. It’s easy to try online at http://plantuml.com/ where there is a text editor with real time image updates as you add more content. 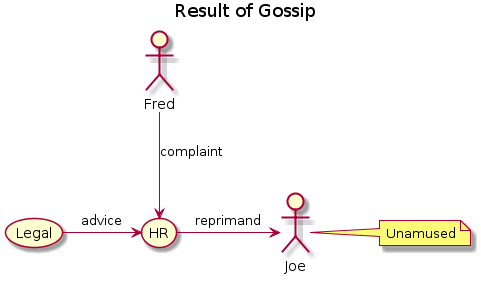 The use of --> as the arrow from Fred to HR makes the line vertical rather than horizontal. You can actually use -left->, -right->, -up-> and -down->, to explicitly select a direction. There isn’t fine control over placement of objects and lines, but using options like line direction and note positioning, it is possible to manipulate the appearance to some degree. "Send Request\nto Engineering" -right-&gt; "Receive Request"
This image, while demonstrating a few new features also shows how the inability to finely control the label “Request Complete?” means that we are at the mercy of the underlying GraphViz layout engine, which is not always perfect. PlantUML can export to PNG, SVG and LaTeX formats, and for sequence diagrams –with some effort– you can generate an ASCII art version, so for those of you writing an RFC right now, this may make your life simpler. Alternatively you could just use the online interactive tool and copy the resulting image from the web page. This is a fun tool! Anybody who has used GraphViz before will be familiar with the agony of seeing an almost but not quite perfect diagram being generated, and as PlantUML uses GraphViz under the covers, you should expect the same here. That said, with a little effort (and occasionally some text padding), the results can be quite impressive for such a small outlay of effort. 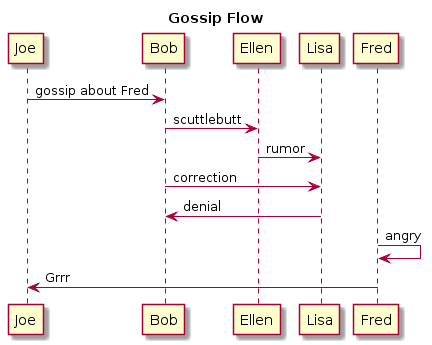 I’m particularly impressed at the ease with which a sequence diagram can be created; I’ll be using that in the future.